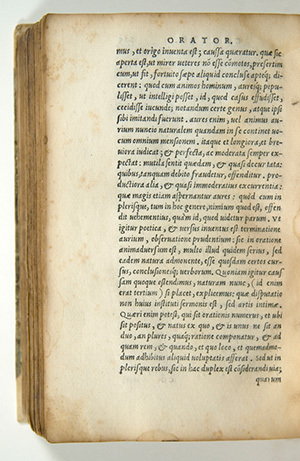 It’s not easy to find an Aldine press book that UCLA doesn’t already hold in its Ahmanson-Murphy Aldine Collection, a world-renowned collection of books printed by Aldus Manutius the Elder (1449?-1515) or his heirs, Paulus Manutius (1512-1574), and Aldus the Younger (1547-1597). The few Aldines we’re missing are usually held in institutional collections, and rarely appear on the international book market for purchase. However, this summer, Library Special Collections was able to add not one, but two, Aldines to its collection. One of them, now on display for a short time in the LSC lobby, is a 1520 edition of Erasmus’ Adagia, a collection of Latin and Greek proverbs. The Adagia, beautifully printed in roman and Greek type, and bearing the characteristic Aldine anchor-and-dolphin device on both the title-page and last page, once belonged to the famous French binder, Jean Grolier (1479-1565), an early collector of Aldines. His ownership inscription appears on the last leaf. Later, the book was owned by Pierre Séguier, a 17th-century French statesman whose personal library was surpassed in value only by the royal collection. His initials, “PS” are gilt-stamped in the spine panels of the binding. Most recently, the Erasmus was part of the library of Herman and Aveve Cohen, owners of the Chiswick Bookshop in New York City.